‘Choose life. Choose a job. Choose a career.’ Choose watching Trainspotting religiously until you can rhyme off their entire iconic opening monologue on command. Adapted from Irvine Welsh’s novel of the same name, written in the dialect of Leith, Edinburgh, Trainspotting is a cult classic film that has been picked up by every generation of teenager since its release in 1996; encouraging viewers to have a long and sobering think about their own life choices as they watch in horror, trembling with the ‘jake shakes’ on hungover Sunday mornings. Since Welsh’s novel is more of a plethora of loosely connected episodes involving a group of drug addicts and degenerates in late ‘80s-early ‘90s Edinburgh – as opposed to a fleshed-out, ‘beginning, middle and end’ story – director Danny Boyle had his work cut out as he essentially constructed the plot for Trainspotting; picking the most prominent of the various narrators from the novel Mark Renton (played by Ewan McGregor) as the film’s protagonist and heroin-addict anti-hero. Alongside some of the film’s best features including: the superb soundtrack which perfectly encapsulates ‘90s drug and rave subculture with hits from Faithless, Underworld and Iggy Pop; and some of Scotland’s greatest acting talent including Robert Carlyle as the pint-sized psycho Francis ‘Franco’ Begbie and Kelly Macdonald as the articulate, too-grown-up-for-her-age Diane. While you’d expect heavy narration in a movie to be a bit of an adaptation-hangover from the novel, Boyle expertly strikes a balance of just enough voice over to inform the viewer, deepen characterisation and keep things interesting but not too much that it draws attention away from the hilarious and, paradoxically, harrowing plots and sub-plots of the film. 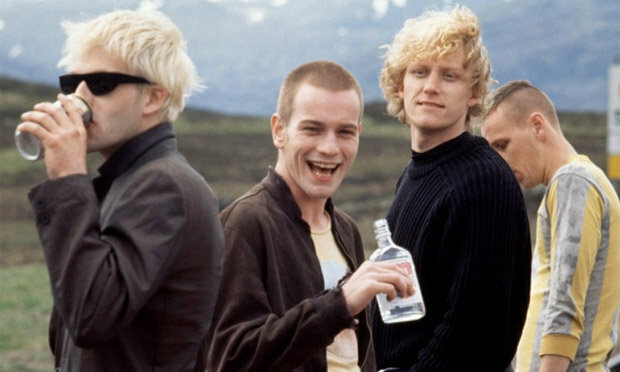 Unsurprisingly, with horrific scenes including the death of neglected baby Dawn and explicit, graphic scenes of intravenous drug use, Trainspotting received a lot of stick upon its release, and continues to today, for its shocking, violent and disturbing content. But while critics will slam Trainspotting and brand it as a ‘pro-drug movie’, on the contrary, many believe that Trainspotting is in fact one of the best anti-drug films ever made as its brutal, frightening and gritty portrayal of what it’s like to be a heroin addict certainly isn’t shown through rose-tinted spectacles. Trainspotting may be gruesome but, due to the subject matter, that’s the way it has to be.